Shore Drive Ocean View Condo-Great Rates! A beautiful, 1000+ square foot, fully equipped vacation condo awaits you, just steps from the beach. Located in the popular 'Shore Drive' section of Myrtle Beach, you can view the ocean from all your windows and the private balcony. A short walk to 'Ocean Annie's' beach bar, and several restaurants, you will enjoy the proximity to everything a beach vacation should be. Apache Pier, at 1260 feet long, just a 5 minute walk up the beach, offers a restaurant/bar, fishing or viewing the beach from the pier. Nearby Tanger Outlet Stores, Super Wal Mart, Barefoot Landing, Alabama Theater and Restaurant Row provide great shopping, dining and entertainment. Relax by one of the two on-site pools if you don't feel like playing in the sand. Or take a stroll on the beautiful no-drive beach of the Atlantic Ocean. Ocean Bridge Condo Association Restrictions: Convenient parking but only ONE car per unit(parking permit required), No grilling, No motorcycles, No RV's, No Trailers, No pets, 25 years of age or older. Conveniently located near Highway 22 & 31 bypass, you can avoid the higher traffic areas during your commute to other areas of Myrtle Beach. Don't wait any longer to reserve your dream vacation!! Living in Northeastern Ohio, a trip to the beach was heaven. Enough of the cold and snow, grey and gloomy skies. The dream of owning beach property finally became reality!! We purchased this property during one of our relaxing vacations with friends. It became a place to unwind, relax and enjoy everything life has to offer. A stroll on the sand, sounds of the ocean, breath taking views of nature. Yet, just a short drive away are shops, restaurants and entertainment. A bit of something for everyone. We are not in a high traffic area. Shore Drive is only 2 lanes and 3 blocks long. No through traffic. Rt. 17, the main 6 lane thorough fare is 1 mile away, eliminating any traffic noise. Several restaurants/pubs are within walking distance. Ocean Annie's beach bar has daily live entertainment throughout the summer. Bathroom 1 is full size with a tub/shower. Bathroom 2 is a half bath off master bedroom (stand up shower). All the unit windows face the ocean with excellent views. Sit on the deck and enjoy the view. No telephone. Must provide your own cell phone. Linens ARE NOT provided! We DO provide pillows and blankets. Queen bed, 2- twin beds, 1 - sleeper sofa. Bath towels ARE NOT provided! We DO provide kitchen towels. Full size sleeper sofa. Chair and ottoman, flat screen cable TV. Electric 30' 4 burner stove. Electric 30' self cleaning oven. Dining room table w/ 6 chairs and 2 bar stools. AM/FM/CD Stereo. MUST STAY IN THE UNIT!! Deck box w/small childrens beach toys,noodles, surf boards, chairs. Please WASH the SAND off before placing back in box. Please leave ALL beach items outside!! Deck with a table and chairs with pool/ocean views. Several off site locations just minutes away. 2 outdoor pools. Not heated. Just a short walk across 2 lane Shore drive to the beach & ocean. Shore drive is only 3 blocks long with local traffic. Several bar/restaurants within walking distance including world famous Ocean Annies beach bar and the longest pier on the East coast, 1260 foot long Apachie Pier. A 24 hr Wal-Mart,Kroger,Tanger Outlets,Bass Pro,ABC stores and Restaurant Row Calabash restaurants only a mile away. Several golf courses are nearby. This was our first time going to Myrtle Beach and this will not be our last! The condo was very clean and had everything you needed to make yourself right at home. The bedrooms are on opposite sides of the condo so you and your guests have lots of privacy. We used the pool everyday and night. The condo grounds are very well kept and very quiet! The beach is literally right across the street! Location, location, location. Bill was very helpful when we were having trouble getting onto the WiFi and got back to us right away. We will be for sure returning to this amazing condo with amazing views! Couldn’t of asked for a better place to stay. The condo was amazing, great location. The condo had everything needed was spotless and beautifully decorated the owner Bill responded to any questions in a very timely manner. This condo was perfect! It was beautifully decorated and extremely comfortable place to stay for a week. It is on the 3rd floor of the building, but it offers a great view of the pool below. That was great since I traveled with teenage girls who wanted to be at the pool by themselves some. 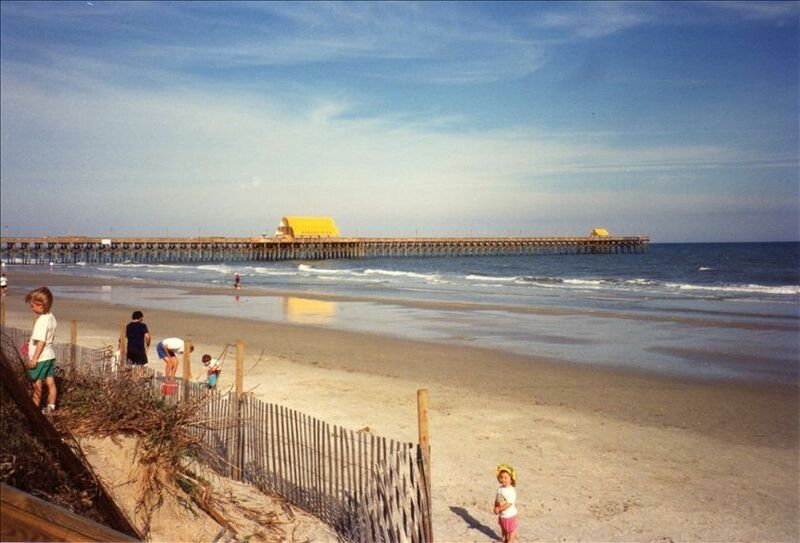 The beach was in walking distance and it was on the quieter end of Myrtle Beach, which was awesome. We were able to go down to the beach when we wanted and didn't have to worry about finding a place to set up. Also, plenty of things to do around the condo or a short drive to other areas of Myrtle. Broadway at the Beach is a great place for teens to go to and hang out too. The owner, Bill, is great to work with. Responds to emails quickly and makes sure you have everything you need prior to arriving. Also, I was so happy to see that there were a few chairs provided in their beach box next to the door entry. I ended up not having room to pack my beach chairs so this was a lifesaver. It made for an awesome first trip to Myrtle. We will definitely return and I definitely recommend this condo to anyone traveling to this area. Described very well in the add. Condo was clean, well laid out, proximity to beach is great! Three floors up should be highlighted. My husband and I stayed here when our house was being repaired from Hurricane Matthew. Bill and Kathy were very understanding and were flexible with our days. The condo was clean and across the street from the beach. I would recommend this property to others! Thanks Sarah for a great review! We were happy to have you stay at our condo while you were dealing with repairs to your home. Friends of ours suggested this location and it was the perfect vacation spot for us, and the process so easy. The condo was freshly painted, clean, comfy and felt like a second home. The kitchen well stocked and the space amble enough for four people. Loved the salt water pool, the sunny balcony, and the 3rd floor view of the ocean just across the street. Restaurants, grocery store and lot of shopping are only a few blocks away. We spent two week here, one with family and the second seeing friends and can't wait to return for another holiday!!! I use VRBO to advertise my property only. All fees are collected by the owner and not through VRBO unless you are using a credit card.